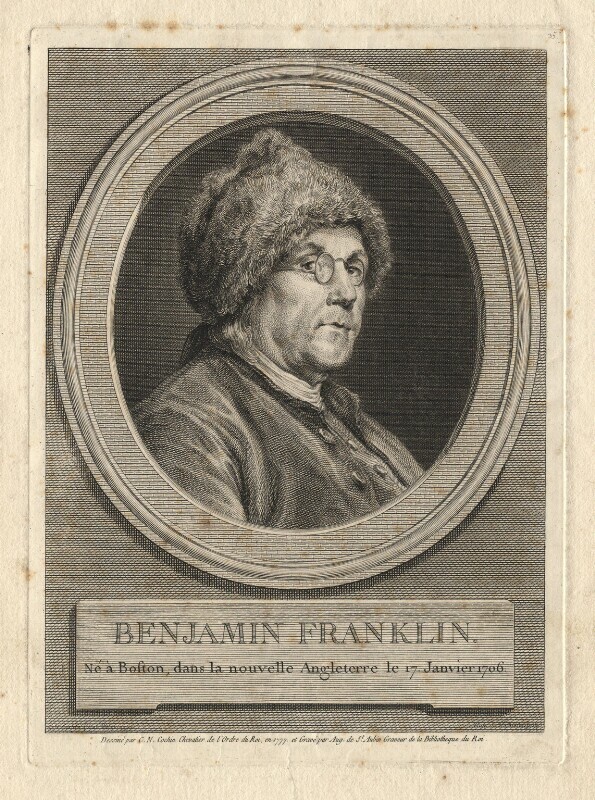 Benjamin Franklin (1706-1790), American statesman; signer of the Declaration of Independence. Sitter in 8 portraits. Charles Nicolas Cochin (1715-1790). Artist associated with 5 portraits. Augustin de Saint-Aubin (1736-1807). Artist associated with 10 portraits. Trent and Mersey Canal is completed under the supervision of engineer James Brindley. Philanthropist and reformer John Howard publishes his study The State of the Prisons in England and Wales. Artist James Barry begins his monumental series of paintings The Progress of Human Culture for the Great Room of the Society of Arts in London. He completes it in 1783. Richard Brinsley Sheridan's second play, The School for Scandal, is an immediate success in London's Drury Lane Theatre. Entrepreneur William Bass establishes the Bass Brewery at Burton upon Trent. American War of Independence: George Washington, heavily defeated at the Battle of Brandywine, is forced to relinquish Philadelphia to the British under General William Howe. At the two Battles of Saratoga only weeks later General John Burgoyne is forced to surrender to the Americans, marking a turning point in the war. The Continental Congress agrees the final version of the Articles of Confederation, defining the terms on which states join the Union.